People are beginning to demand a higher standard of user experience (UX) quality from the software systems they use in their business and personal lives, and companies are looking to UX to help drive business value and increase brand strength. Effective UI provides a complete roadmap to building groundbreaking software centered on UX quality, including how to generate management support, employing product management strategies proven to deliver greater success, and how to manage the design, engineering, staffing, and business considerations that must be centered on the user's needs and working effectively in tandem all throughout the project. Powerfully differentiating products, services, and brands to create a competitive advantage. For business and product managers trying to get innovative products funded and successfully built, for software professionals struggling to advance the cause of better UX, and for anyone else who needs to effectively advocate for and deliver on the promise of higher quality software, Effective UI is a comprehensive, valuable resource. 03/25/2011"Effective UI" is a long-awaited book for assisting with the design of the user interface to enhance the user experience. We all know what bad user interfaces are and have experienced them. We really appreciate the effective ones and don't tend to notice them, because we are able to effectively and efficiently accomplish the goals on the site or application that we have set out to do. This book goes through the steps to discover the appropriate user interface by planning and eliciting requirements, assessing the business perspective, understanding the needs of the users, and culminating these artifacts into a design. The design is then iterated through to the effective user experience. While the methodology, process, and guidelines are offered in this book with a good deal of pointers and practices from the effective user interface team, I would have liked to have seen a case study using this methodology and following through to user interface completion. This could easily be an example of how to craft an effective (or ineffective) user interface. I am a developer who can take business requirements to design and implementation, but I sometimes struggle with the user experience and user interface. This book helped me to overcome these deficiencies in a thoughtful, planned, and researched manner. The authors point out that the user interface process as well as the general philosophy of getting to an effective user interface is both art and science. They also note that this combination tends to be based on decisions that are made through the process and offer suggestions as to why particular choices are made when these situations arise. I would recommend this to anyone involved in working on the user interface and interested in presenting a better user experience. Readers who have had some experience with user interfaces and would like to hone their decision-making process based on a team’s effort would benefit from this book. A novice might would benefit from looking through comparisons of what good and poor interfaces look like and then reading this book to get a feel for the process necessary to achieve a good one. With competition for the user’s attention becoming more intense, it is important that the user experience be the best it can be. Review By: Herb Ford Jr.
03/25/2011"Effective UI: The Art of Building a Great User Experience in Software" has some timeless sections. The chapters "Effective Planning and Requirements," "Bringing Together a Team," "Getting the Business Perspective," and "Getting to Know the User" are especially important when it comes delivering a product. The book covers details from obtaining customer feedback to building business requirements. The section on building a team from the ground up provides great information on the team concept and team responsibility. This book could be used in whole by a start-up company or in part by a seasoned company that has run into issues. For example, if a seasoned company has repeatedly not met the client's expectations, sections of the book can assist in that area. The authors do a good job of providing examples of how to communicate through the project team as well as to the clients to obtain valuable information. Effective UI is very easy to understand, and some may use it as a reference guide. It is suited for both the novice, who is just getting started, and the expert, who might need to enhance a section of the product lifecycle. Everyone should consider purchasing this book with the increased usage of the Internet and web-facing products that the public uses today. I would not use this book if a drastic and quick change is needed. 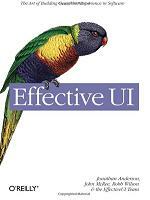 This book provides the framework for a methodology change in the way UIs are built and created. It offers more than just how to build an effective UI, but also how create and implement it as well.